Ozone (O3) and Particulate Matter PM2.5 are a powerful combination to monitor together. Not only do they have serious health impacts individually, when put together they’re important contributors to photochemical smog – that thick, brown haze which blankets many polluted cities world-wide, especially in summer, and still, sunny days in winter. The health impacts of PM2.5 and ozone separately are well documented, however increasingly, studies are drawing heath implications of both. A study in India recently found that PM2.5 and ozone contribute to about 570,000 premature deaths a year. In China, PM2.5 and ozone are considered the pollutants of most concern, with ozone dominating in summer. Recent results from the Pearl River Delta reported a decrease in overall pollutants, but an increase in ozone, causing concern around health impacts and smog risk. PM2.5, is the name given to microscopic particles less than 2.5 µm (micrometers) in diameter. 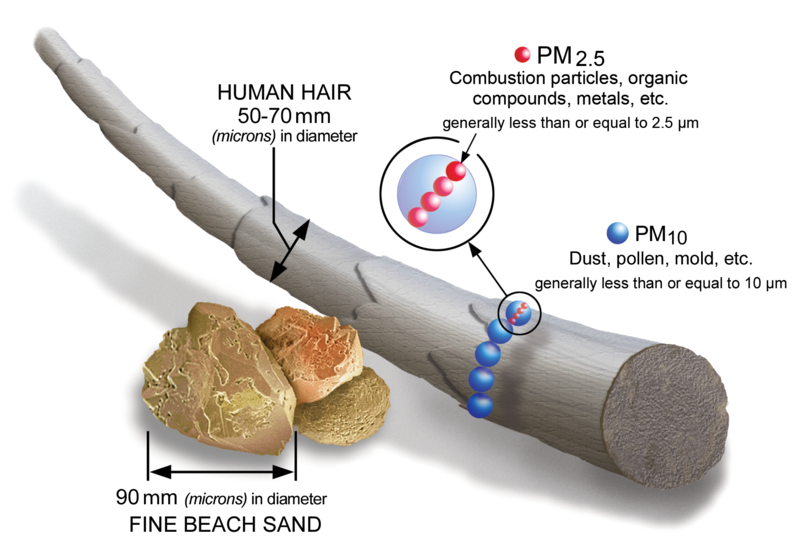 PM2.5 particles are tiny – around 20 times smaller than a human hair! Globally, the key sources of PM2.5 from human activities – burning fuels like diesel and coal, industrial emissions and vehicles all contribute PM2.5 to the environment. In 2013, the World Health Organisation (WHO) classified PM (Particulate Matter) as carcinogenic to humans, responsible for the deaths of 3.7 million people worldwide per year. The tiny size of PM2.5 means that they’re easily inhaled by people, and that the particles are able to penetrate deep into the lungs, causing respiratory and cardiovascular problems. In severe cases, or in susceptible individuals such as children or the elderly, this can result in all manner of diseases. Recent research has shown that PM2.5 can pass into the blood, where it can cause leukaemia (Jin et al. 2016) and impacts the body’s ability to create white blood cells. All PM2.5 is harmful, but some is more harmful than others – for instance when it has a higher heavy metals content or is from an industrial source, and comprised of additional pollutants. For example, burning CCA treated timber, commonly used for building, releases particles with copper, chromate and arsenic bound to them. Ozone – both good and bad! Ozone is present at all levels in our atmosphere. High in the atmosphere, ‘good’ ozone protects us from harmful incoming Ultra Violet (UV) radiation. This ozone layer suffered depletion, but is now showing signs of recovery. Ozone is also widely used in industry for cleaning and sterilisation. At ground level though, ozone is ‘bad’ – widely linked to Asthma, bronchitis and premature deaths. High levels of ozone are toxic, and can affect crops and other plants. When ambient concentrations are elevated (i.e. 100 parts per billon (ppb) or higher) crop yield can be reduced by up to 50%. Ozone is not emitted directly, rather it is typically formed through complicated photochemical reactions, involving Nitrogen Oxides (NOx) and Volatile Organic Compounds (VOC) (both typically emitted from vehicles and industrial sources). As temperature increases on say a hot summer’s afternoon, the efficiency of this reaction increases, and more ozone is formed. Large urban areas often have the perfect combination of emissions and warm temperatures allowing the photochemical reaction to create the brown ‘smog’ blanket which is a feature of many large cities worldwide. Ozone concentrations are generally highest in cities and urban areas, but areas downwind of cities and industrial facilities can also be affected. Photochemical smog monitoring – why ozone and PM2.5? Ozone and PM2.5 give a well-rounded picture of air quality, and in the majority of regions are listed criteria pollutants controlled by ambient air quality standards. They are usually inversely correlated. Most regions have a defined ‘ozone season’ when high concentrations are expected, usually through summer, when it’s warm enough for ozone to form. Both ozone and PM2.5 are readily transported, and they therefore can affect a larger area than other pollutants. NOx has local impacts (i.e. near busy roads) but a wider impact as it is essential for ozone formation which is then readily transported. A study in 2015 found that ozone originating in China was being transported across the Pacific Ocean to the USA. This impacted ozone concentrations in the USA, despite NOx emissions in the western USA being reduced by 20% in emergency efforts to reduce concentrations. PM2.5 can be caused by atmospheric gas-to-particle conversion, forming Secondary Organic Aerosols, especially when NOx concentrations are high. In order to reduce the PM2.5 concentrations, control of NOx and VOC would also be required. These are the precursors to ozone formation, so reducing these reduces ozone, which in turn reduces smog and brown haze events. Aeroqual has just released the AQS 1 ‘smog monitor’ designed to measure PM2.5 and ozone simultaneously. The compact instrument can be used individually or deployed in networks to give an accurate real-time understanding of photochemical smog formation and distribution. The ease of installation and straightforward operation and servicing makes near reference ozone and PM2.5 monitoring possible in locations you may not have considered or thought possible in the past. Contact us to discuss your near reference monitoring requirements.